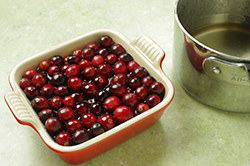 A good soaking in simple syrup brings out the best in cranberries. 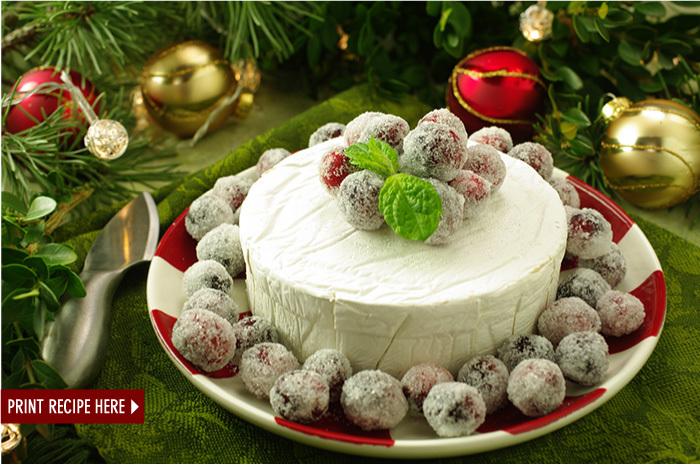 Any bitterness or tartness experienced with raw cranberries melts away making these festive fruits a delicious treat and a sparkling presentation. 1. 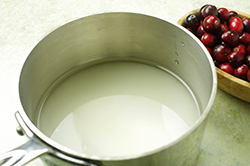 In a small saucepan, heat half of the sugar (1 cup) and water together over low heat until the sugar is completely dissolved and the mixture clear. The mixture will not need to simmer or come to a boil in order for the sugar to be dissolved. 3. Drain the cranberries well. Place the remaining 1 cup of sugar in a shallow bowl. While still wet, roll the cranberries in small batches until well coated. 4. 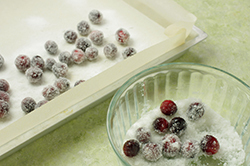 Place the sugar-coated cranberries in a single layer on a rimmed baking sheet and allow to air dry for an hour. Periodically, roll the cranberries around so that all surfaces have a chance to dry. 5. Once the surface has dried and a nice sugar crust has formed, the cranberries may be covered and stored in the refrigerated for up to 2 days. 6. 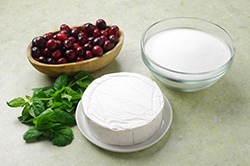 To serve with Brie cheese, garnish the top and sides with the candied cranberries and fresh mint.